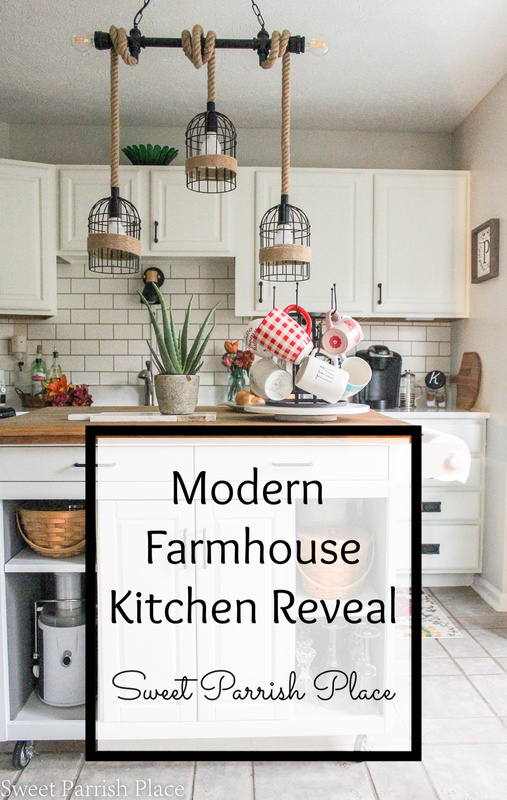 It’s long overdue and over 6 weeks in the making, but I am so happy to reveal my modern farmhouse kitchen to you today! Hey friends! 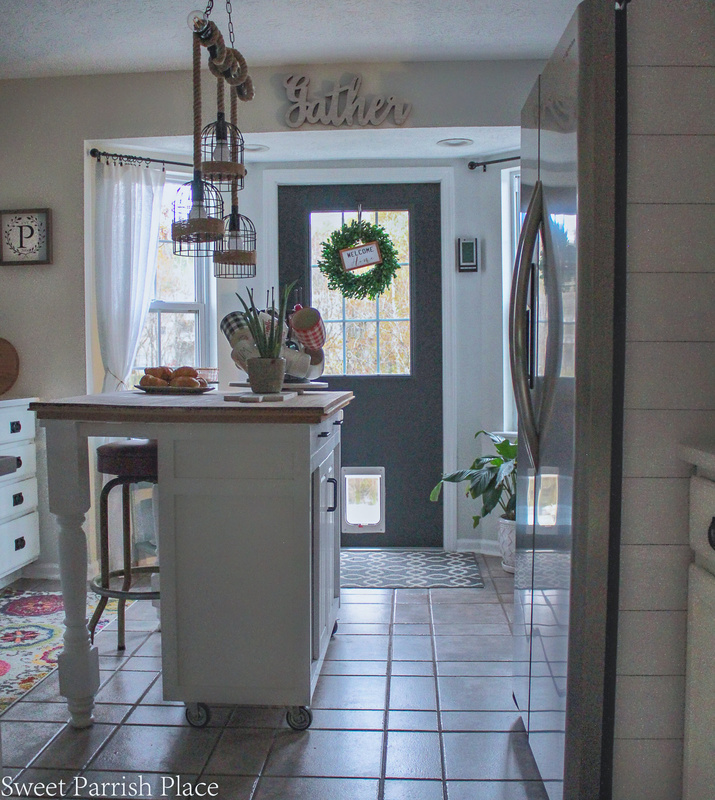 The big reveal is finally here, and I am so excited to share my new favorite room in our house, our modern farmhouse kitchen. 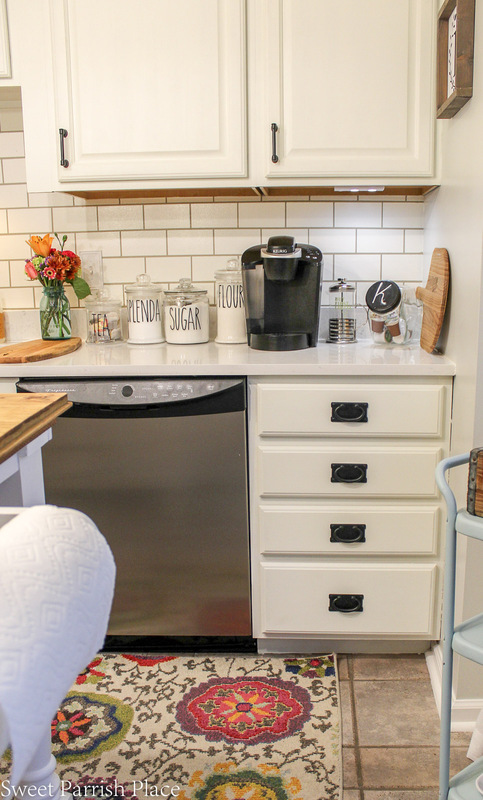 Its light, bright, and white with some fun pops of color, and I can’t believe how much it improved the overall look and feel of our home. Please indulge me by allowing me to share way more photos than usual because I just can’t help myself. 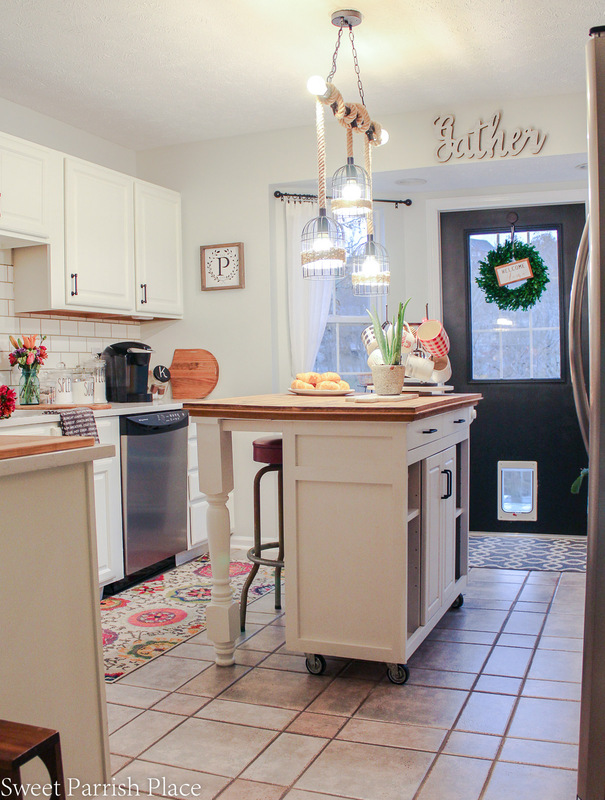 I schemed and dreamed this kitchen transformation for a long time before my husband and I finally made it a reality. And I just want to share every little detail with you guys! I have to admit, we were right down to the wire on this deadline. And as luck would have it, we had a little weekend trip that we had planned before I committed to this challenge. I spent every evening last week doing little things like painting trim and touching things up here and there. I took a day off last Thursday to get this kitchen all cleaned and styled, and had planned to take photos that day too. It took me longer than expected because the entire room was covered in dust from where we had sanded the wood top on the kitchen island. Every last nook and cranny had to be cleaned. By the time I was finished it was too dark to photograph the space. We were leaving Saturday morning, and I wanted to have the photographs taken so I could start the editing process, so my only option was to take photos after work on Friday. Which left me about a 2 1/2 hour window to take them before it was dark. As luck would have it, it was a gloomy day, so I had to make due, but if I’m being honest, I’m not super happy with how the photos turned out. I was forced to turn on the lights at times so that I could get decent shots. And I really wanted to shoot in natural light. Bummer. But I did the best I could with what I had to work with, and to make the deadline for the reveal. 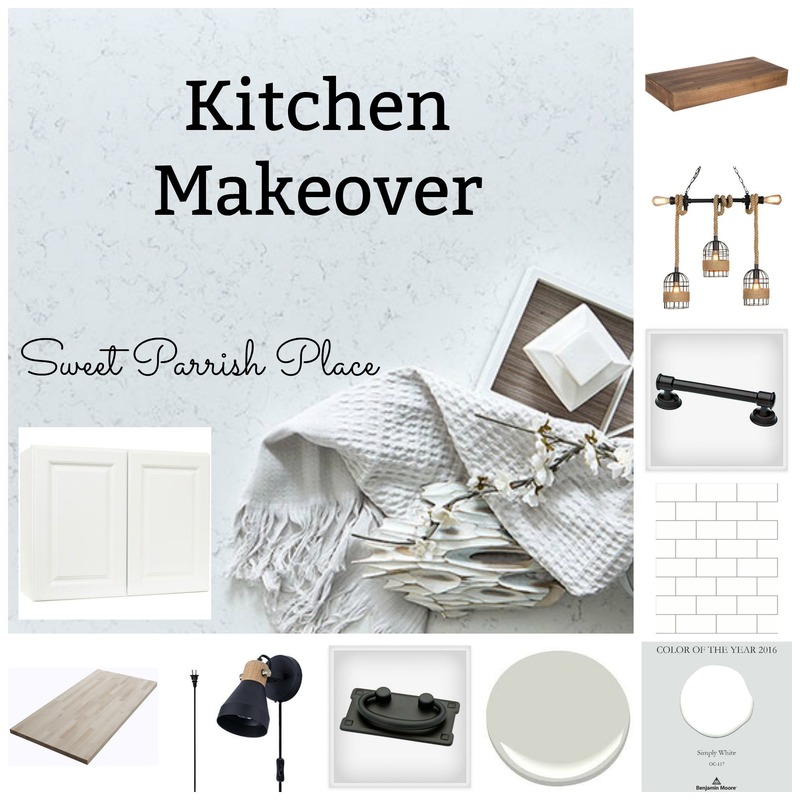 Let me quickly remind you of my inspiration board for this kitchen makeover. 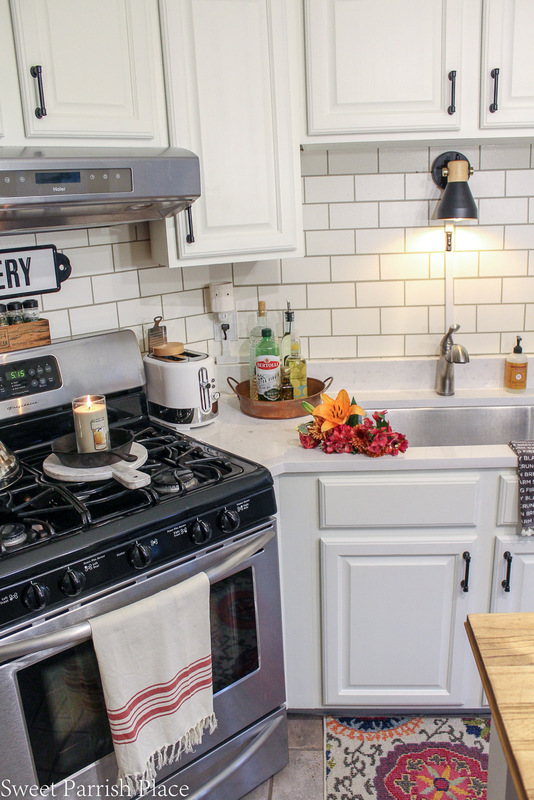 I shared this during week one of the challenge, and I am happy to report that I think we got pretty close to the vision I had for this kitchen. My main goal was to brighten this space, have a white kitchen, and do the entire thing on a budget. This was not a gut job. 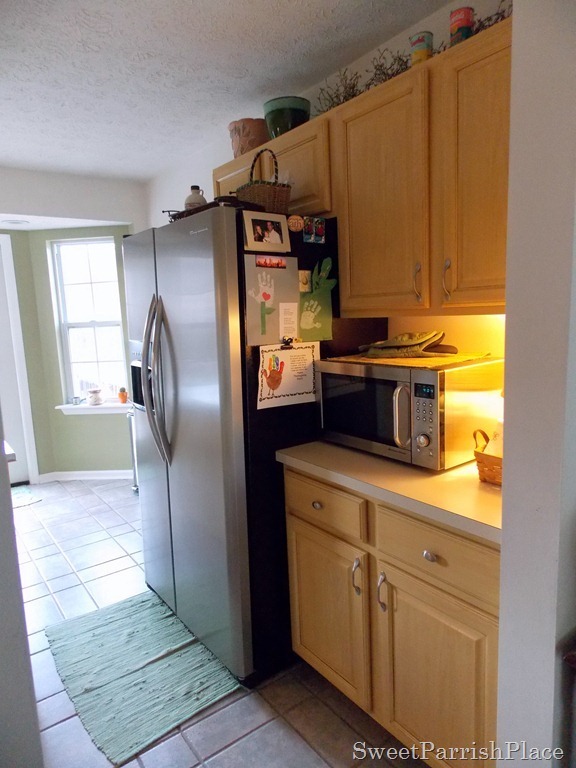 We didn’t replace any of the appliances, and we left the structure and cabinets the same. But we managed to give this kitchen quite the facelift and it definitely feels like it is now part of 2018. 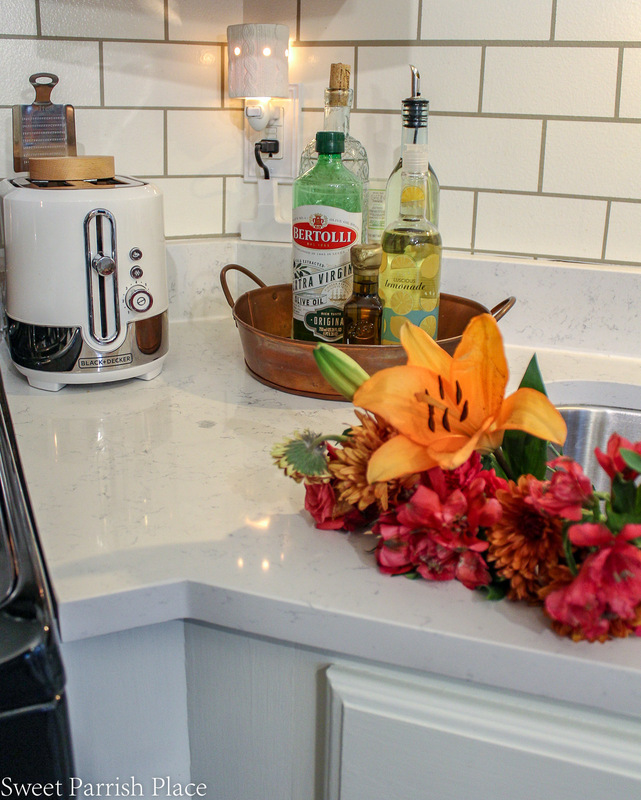 A white kitchen is something I have always dreamed of, and I could not be happier to have made that dream a reality. 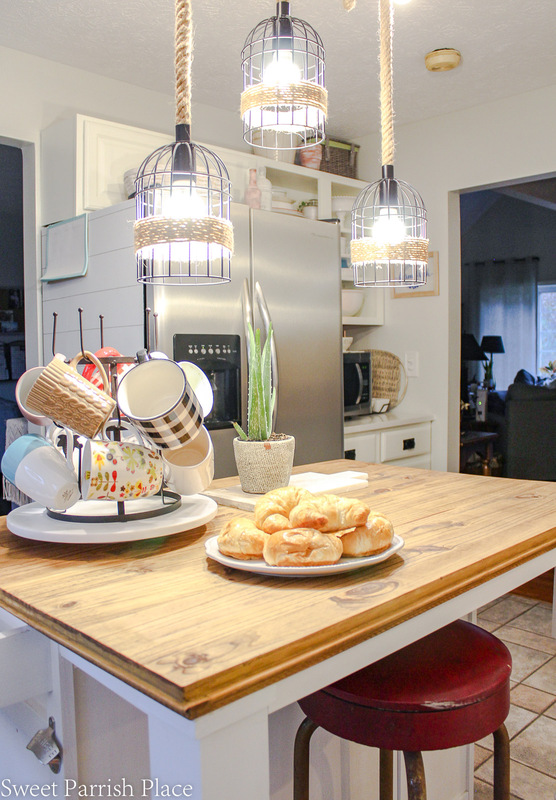 This is not our forever home, and this is not our dream kitchen, but I feel like we did a great job of bringing our vision to life and I think this updated kitchen is going to be fantastic for resale on this home. Which is a good thing because our years in this house are numbered. I feel like this post has been pretty wordy up to this point, so it is time for me to shush up and let you look at all of the pretty pictures, because after all, isn’t that what you are really here for? 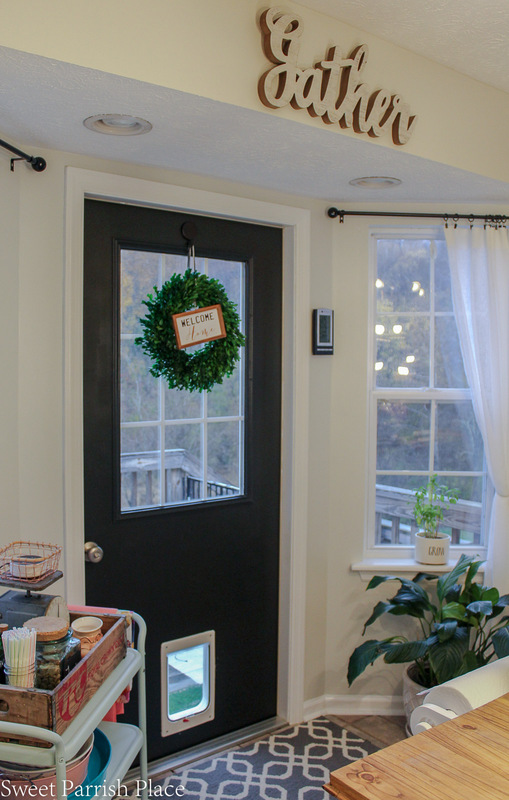 Throughout this post, I will share before photos of this space from similar vantage points so that you can see just how much this space has been transformed. And then at the bottom of the post I will be sharing a whole source list of paint colors and products used that I am able to link to. The source list will probably not be quite finalized at the time that this post goes live, but I will be updating it in a timely manner as soon as possible, so if you are looking for sources of anything in this space and don’t see them linked, please check back because it will definitely all be there within the next 24 hours. When you look at the above and the below photo you can get a first glimpse of the transformation this room has undergone. 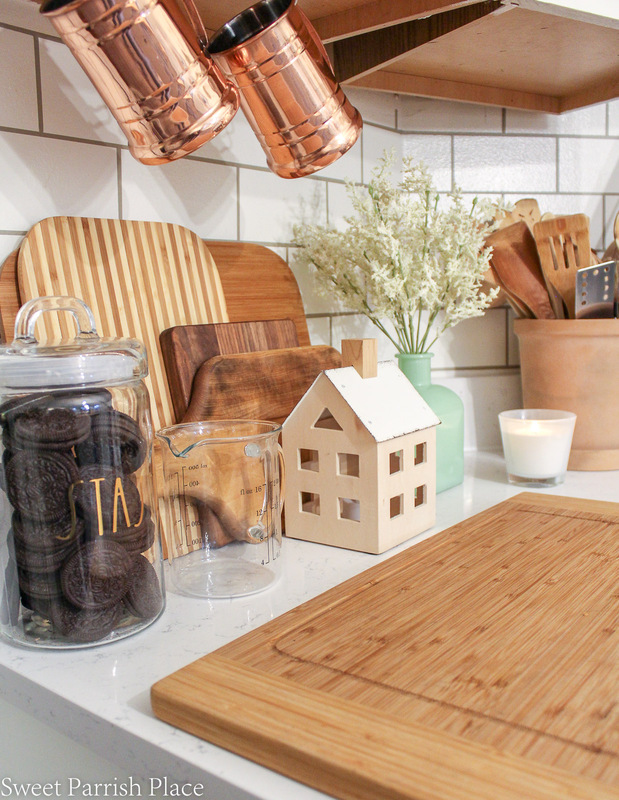 The kitchen island doesn’t even look like the same island, but it is. I’ll be sharing a full tutorial for how we got it to what it is today in an upcoming post. I want to give a huge thank you to my sponsor, Liberty Hardware, for providing the cabinet and drawer pulls and the wall plates for this space. 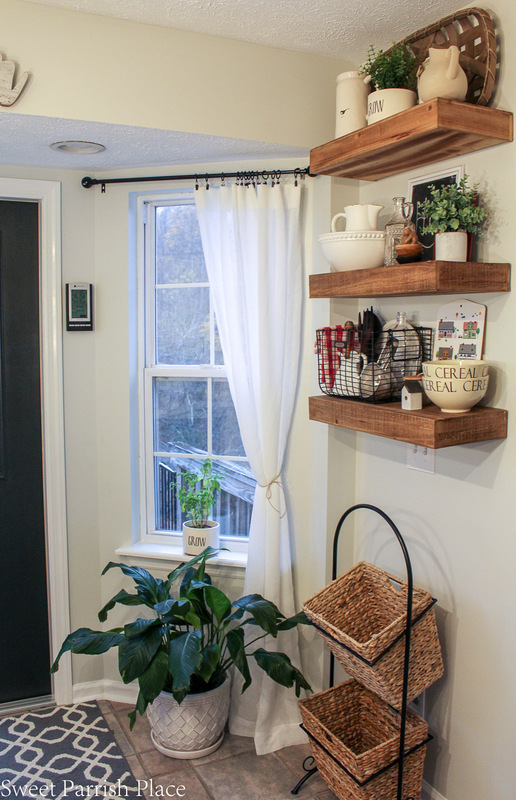 This little nook- that took me a long time to figure out how best to utilize it, but I think I have finally figured out what works best for our family. And I love the way the black door pops during the day, and kind of recedes into the darkness at night. The white linen curtains are light and airy, and the long length is unexpected but I think they work perfectly in here. This next before and after goes way back to before we purchased this house. This is what it looked like when the old owners lived here. And it was this way the day we moved in. I just cannot even express how much better this space feels to me now, and my husband feels the same way. It makes me happy! 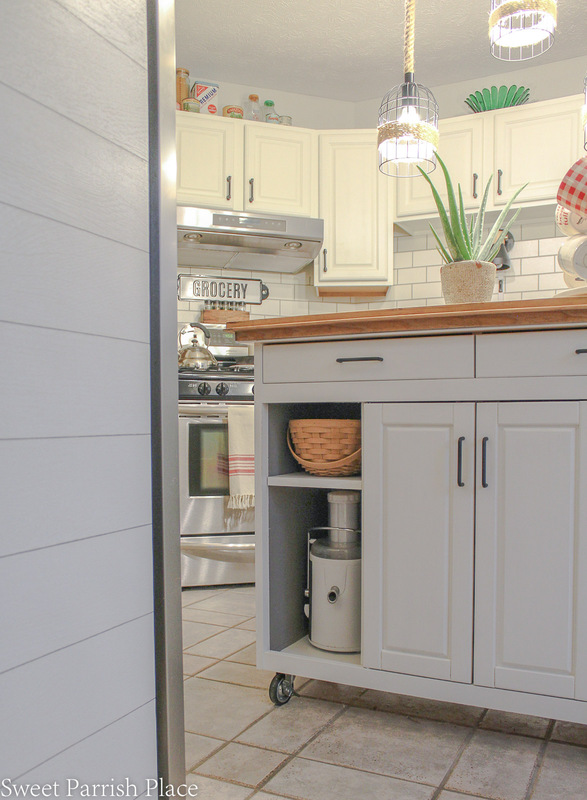 I added some peel and stick shiplap wallpaper to the sides of our refrigerator to hide the ugly black, and it was a wonderful and affordable solution. It made the fridge look so much more unobtrusive. You can see a peek of the side of the refrigerator in this photo below. One of the other little details I did at the last minute was to remove the hardware from this island and spray paint it in a matte black. Since we ran out of time of being able to add the same pulls as on our cabinets, this was an easy way to make the old pulls coordinate better with the new kitchen. One day, I may get around to actually changing out this hardware, but it will require us to fill holes and repaint he drawers and cabinets. 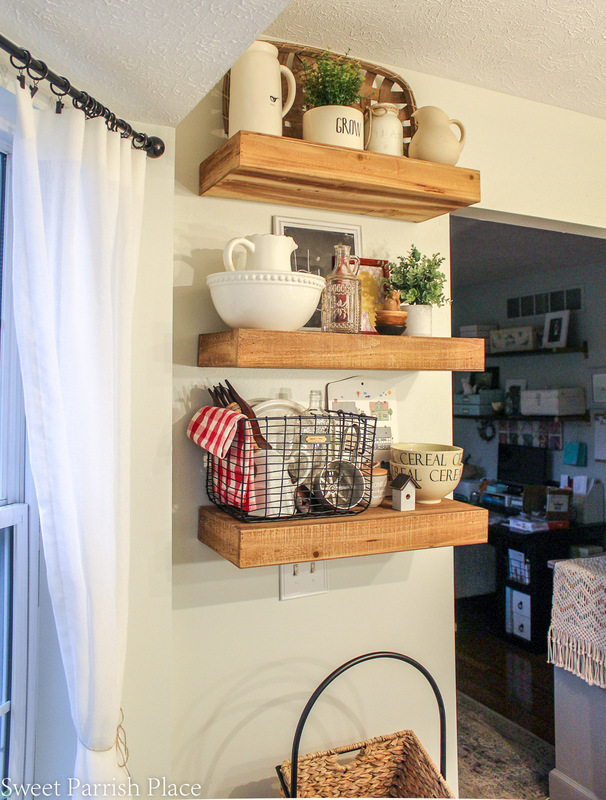 These open shelves we added in here are one thing I have tried to save as a surprise for the reveal today, because I didn’t want to give away everything. 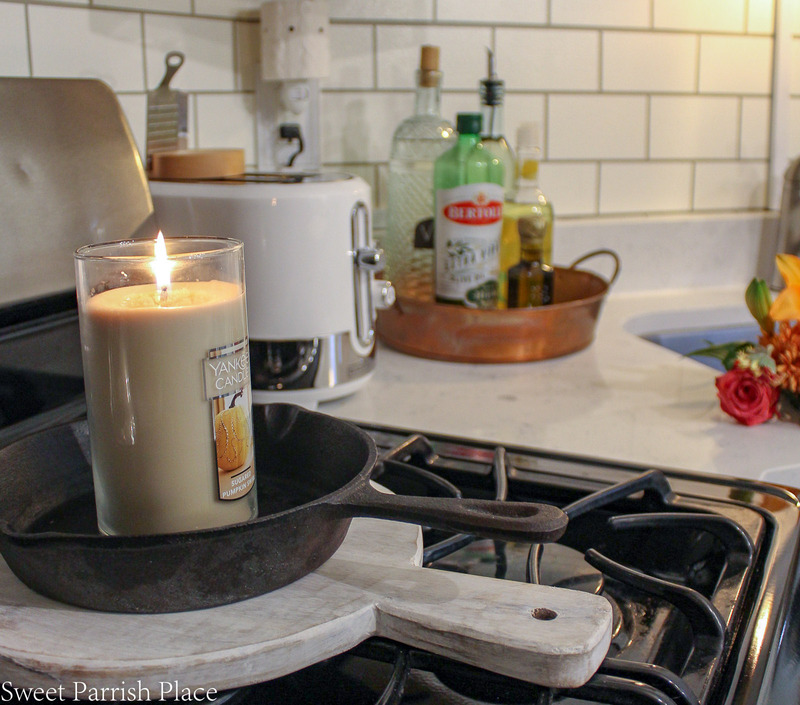 One goal I had was to create more spots where I could create pretty vignettes in this room. I believe I achieved that by both adding these shelves and removing the doors from two of our cabinets to create an open shelving effect. 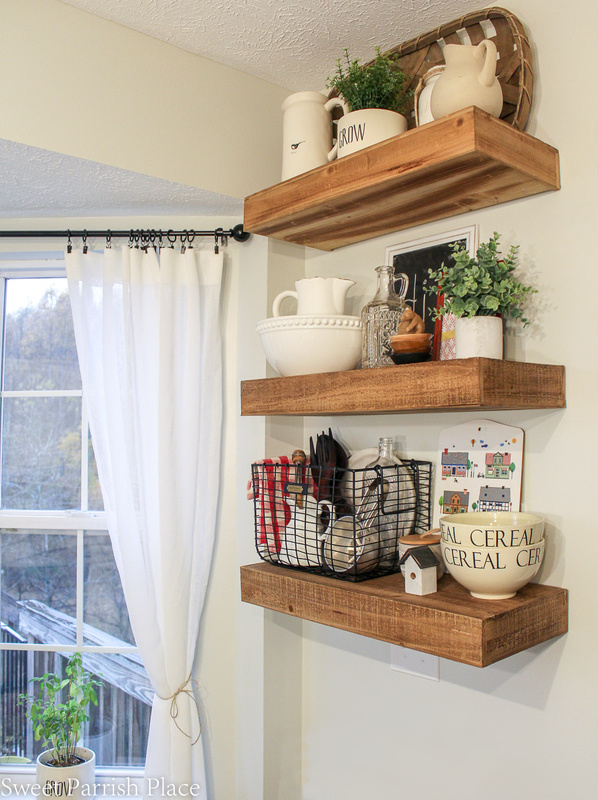 I found these floating shelves at Hobby Lobby, and I loved the rustic texture they had and the color of the wood. I knew when I found these that I wanted to make our wood top on our island a similar color. I had fun styling these, and I know they are going to be a favorite place to decorate for seasonal decor. In the photo below, you can see the wood of the island top with the wood of the open shelves, and I think they are pretty close! I really love the way these shelves and the island top warm up this space. I am so smitten over these wood elements! When you see this next before and after, it hardly even looks like the same space! When I look at the difference in these photos, it really is proof of all of the hard work and planning that went into this transformation. And I am so proud at what my husband and I were able to achieve on a budget. 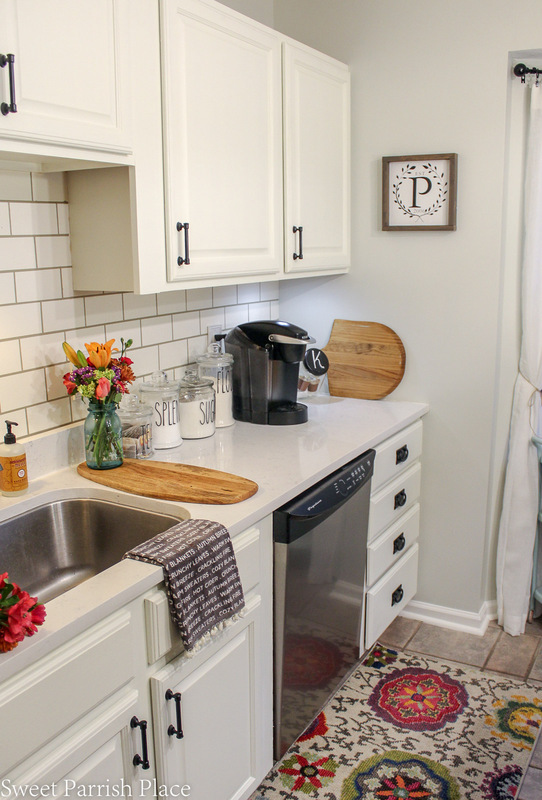 The one thing we did splurge a bit on were the quartz counters that started this entire domino effect that led to this kitchen makeover. I chose a beautiful quartz called fairy white that has the prettiest marble like veining throughout. It is a huge upgrade from the formica counters that I believe had been here since 1996. The large stainless steel single bowl sink that is an undermount was also a big improvement to the space. I love having just the one large bowl, and the undermount makes it easy to wipe crumbs right into. 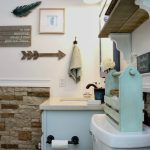 I would have loved a farmhouse sink, but that would have required some changes to the cabinetry below, and we didn’t want to take that on. I am happy with our choice. I partnered with Liberty Hardware for this ORC, and they supplied me with all of the beautiful drawer and cabinet pulls and wall plates. I chose a matte black for them and I love the way the black pops against the white. I feel like the pulls really made my dream for these cabinets come to life. And of course, the white just makes me feel like Christmas morning every time I walk into this room. Painting cabinets is no joke friends. 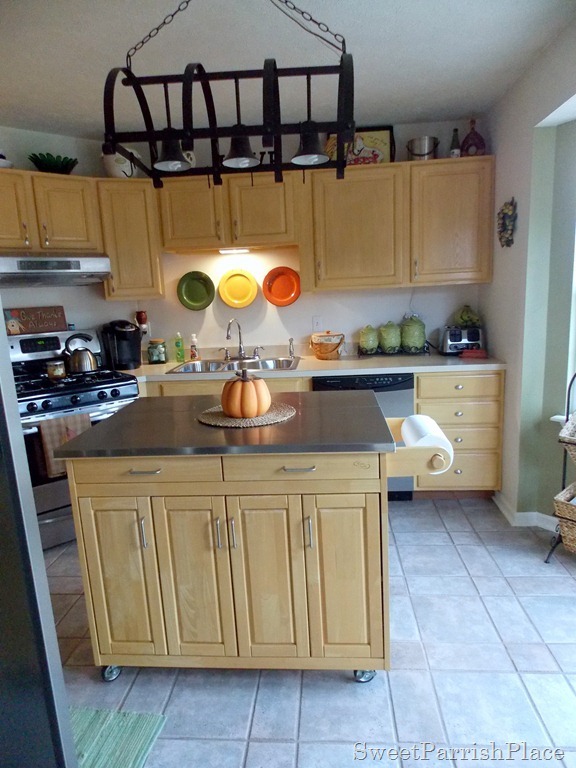 It was a painstaking project, and it was also the second time I took it on with these cabinets. And I can guarantee you it was the last, for this kitchen anyway! I will be writing a full cabinet painting tutorial in an upcoming post. 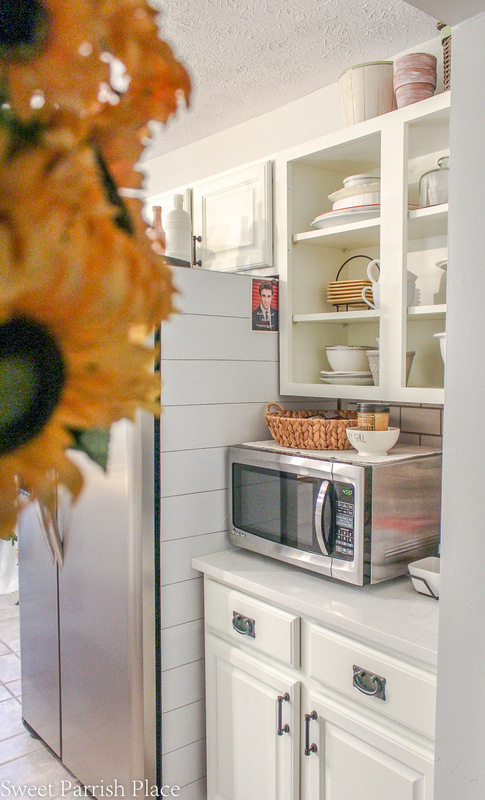 The color I chose for the cabinets is Simply White by Benjamin Moore. I shared the entire process and everything I went through during on my Instagram stories, and you can find them in my story highlights under kitchen 1 and kitchen 2. 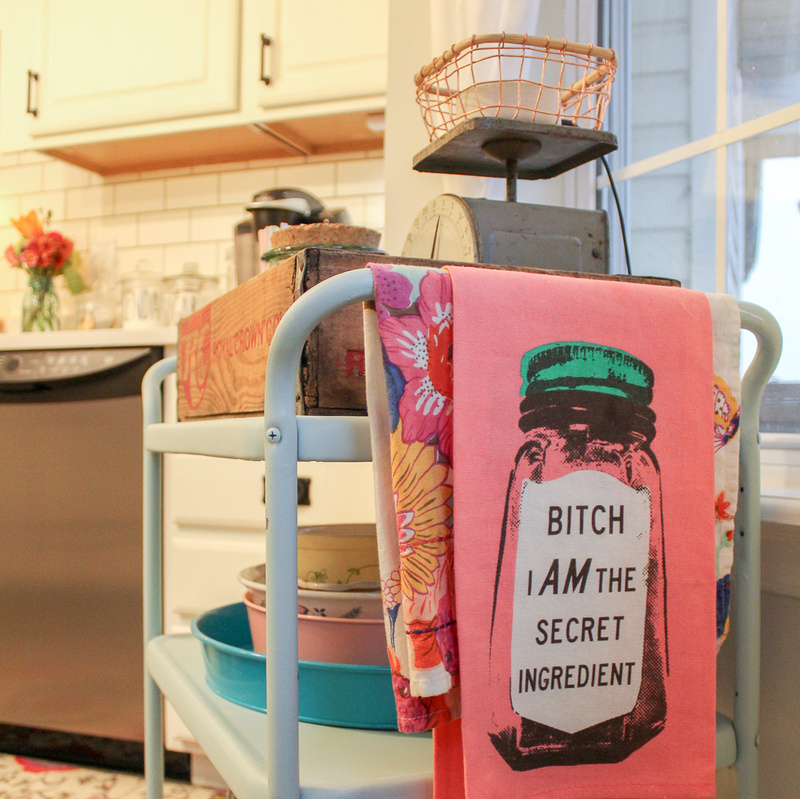 I found this kitchen towel in New York over the summer, and couldn’t resist buying it because it makes me chuckle. I have a friend who saw it in my kitchen and immediately go online and searched for one. She found it, and now it hangs in her kitchen as well. 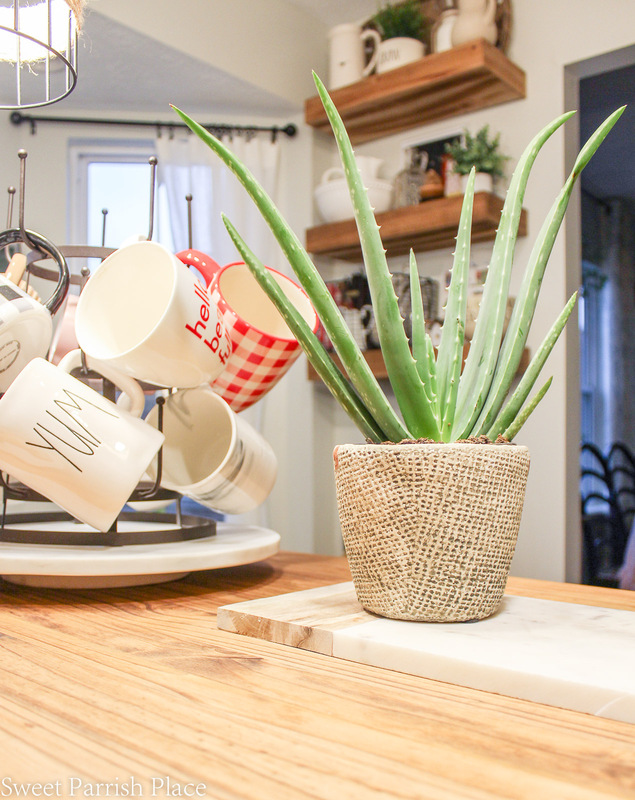 I didn’t find a utensil holder I liked, but I did find this vintage looking planter and decided it would make a great utensil holder. It adds a touch of the unexpected and whimsy, and I love it. Changing out the light over the island was an instant facelift for this room. I don’t even think I fully understood how much changing out a light could change a room until we changed this light. Because before, I could barely see to work in this kitchen at night, and now it is so bright and easy to see at night. At first the change was a little startling because it was so dramatic of a difference, but we quickly got used to it, and I appreciate it so much every time I’m working in here cooking or cleaning at night time. 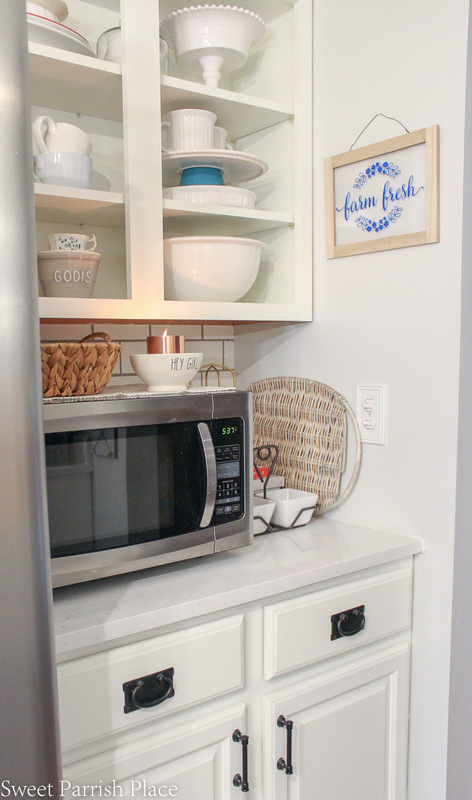 We removed the cabinet doors in this area of the kitchen, and we beefed up the shelves in here and painted it all white. I loaded it up with dishes that we already have, and we use occasionally. There are serving trays and bowls that we use when we entertain, and also a few every day items, mostly in white with a few pops of color. Since a lot of these items get used, they also get washed, so it’s not too bad to upkeep. 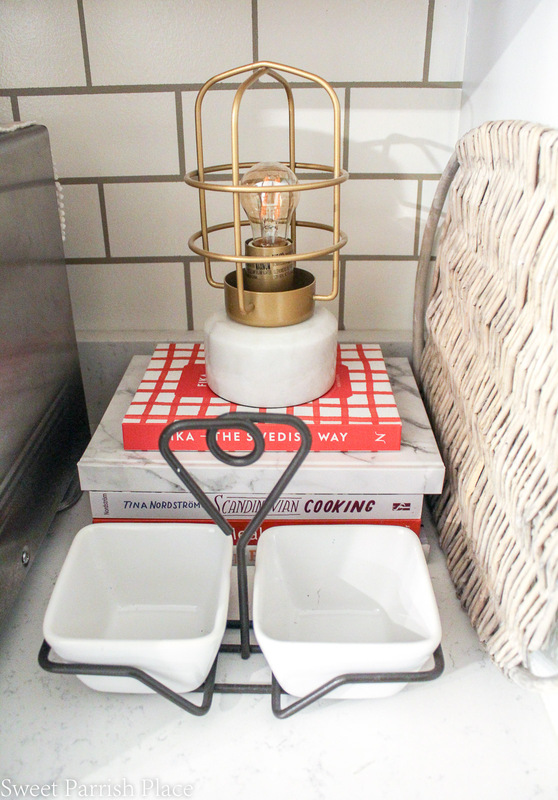 I love the little gold cage lamp with the marble base that I chose for the dark little corner next to the microwave. I sure do wish I had a way to hide this microwave in a cabinet or something, but that wasn’t possible in here. I ordered clear glass canisters that have a classic vibe, and I then ordered some Rae Dunn inspired decal stickers to put on the canisters. I think they are really fun and I love the way they turned out. And if I get sick of them, they will be easy to remove. 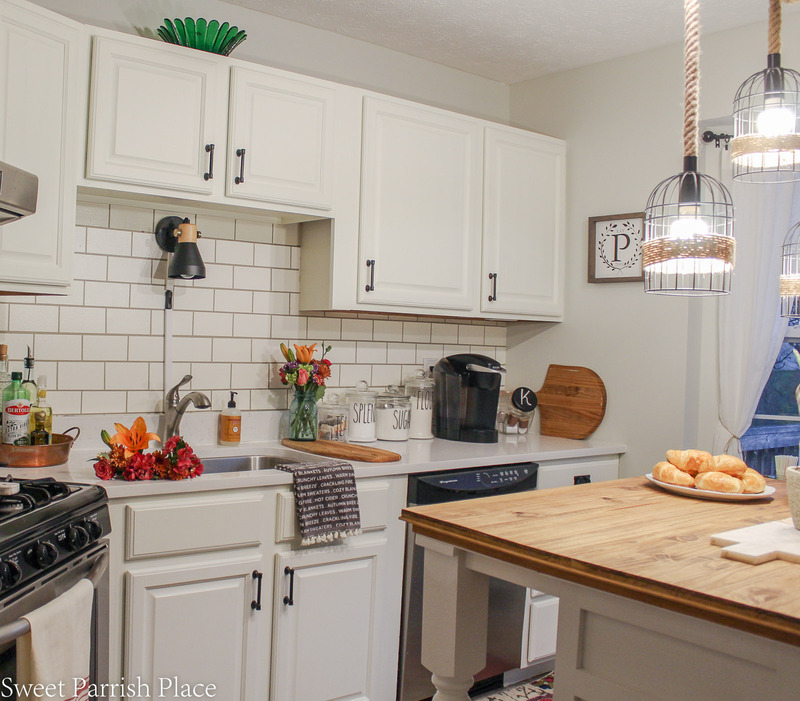 I am still smiling from ear to ear over this modern farmhouse kitchen makeover, and I still feel like I need to pinch myself that it is in our home! 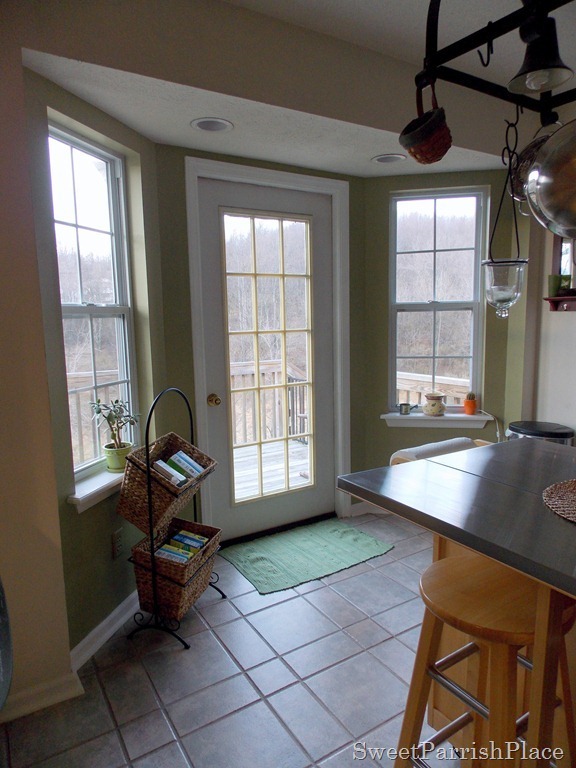 I truly feel like this kitchen made this home feel leaps and bounds more like our home. It is finally a reflection of my style, and I love spending time in here now. I mean, I still hate to cook, but I like to brew a cup of hot tea and sit at the island and browse the internet. Ha! I also don’t mind cleaning it now because it’s so much prettier, but I’m sure that will be short lived. It looks great!! That light fixture is to die for! Thanks Jenn, We love the new light so much more than the old one! Looks sooooooo good!!! 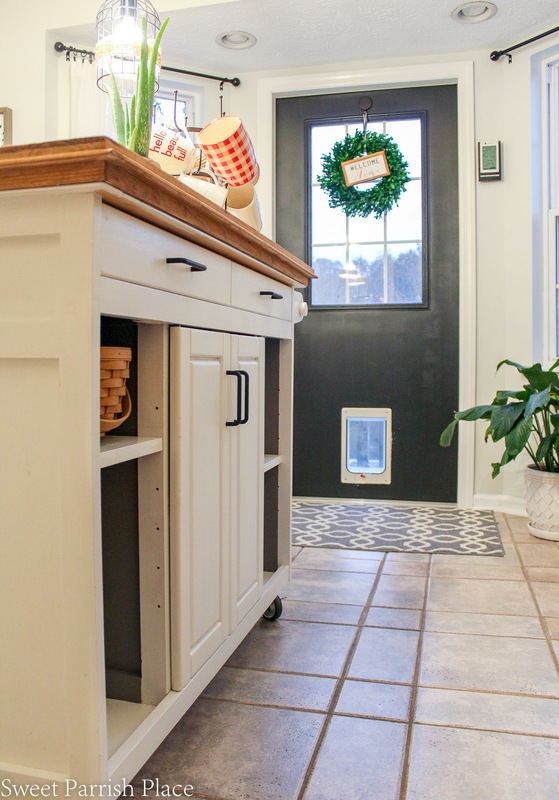 Painting the cabinets made such a huge difference. I love the new light too! great job! Thanks! I feel like they are soooo much better white! The white cabinets are so bright and fresh. It looks awesome. Nice work! 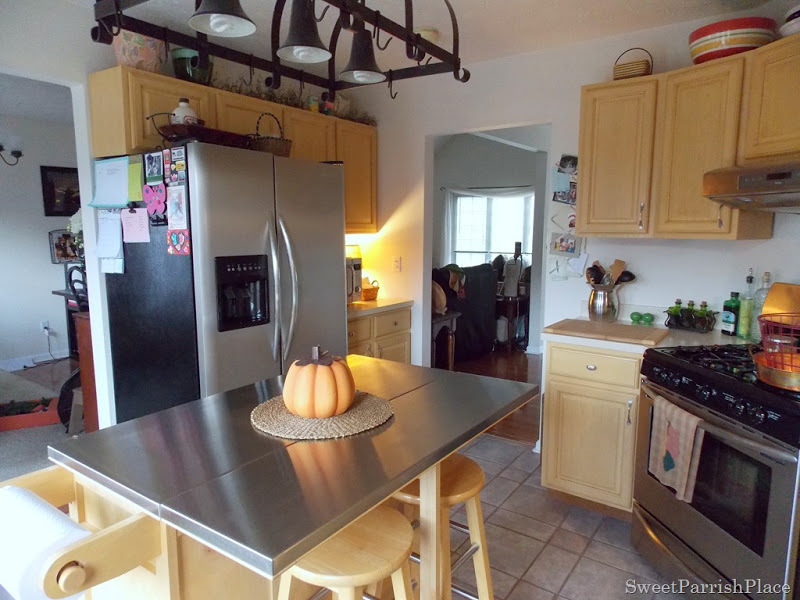 Your kitchen turned out great! I love how bright and fresh it feels now! Hi Emy! Thank you so much. We are so happy with the results! Nicki, this transformation is seriously fabulous! It looks so fresh and bright now. You have done a lot of work and it has paid off. I love the shelves and the way that you have styled them. Such a great job! Thank you Sherry! We are so excited to be able to live in and use this finished kitchen now. Love this transformation! 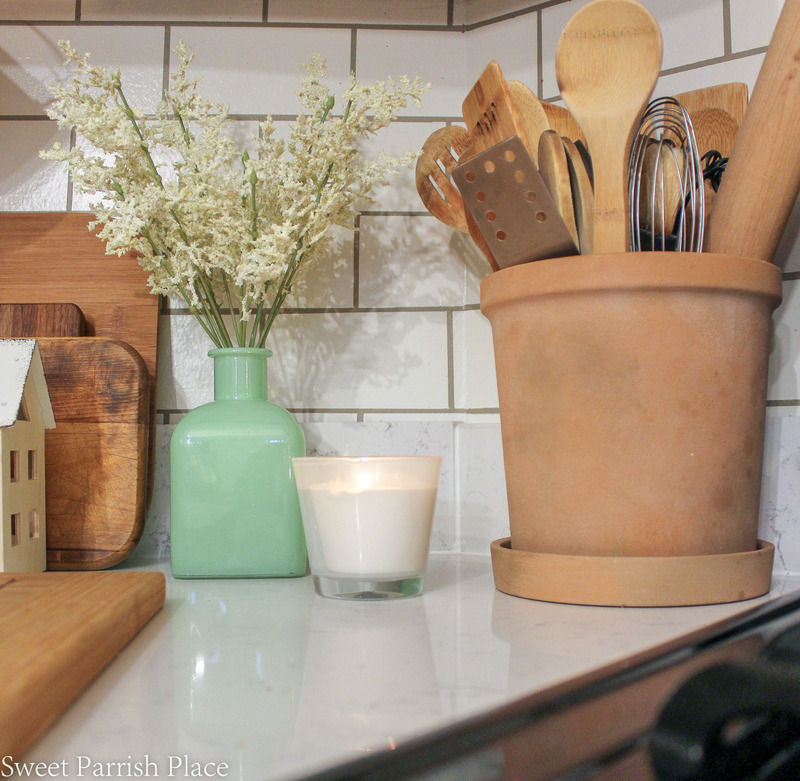 I wanted to do tile just like that in our kitchen makeover but didn’t have the time to do it. 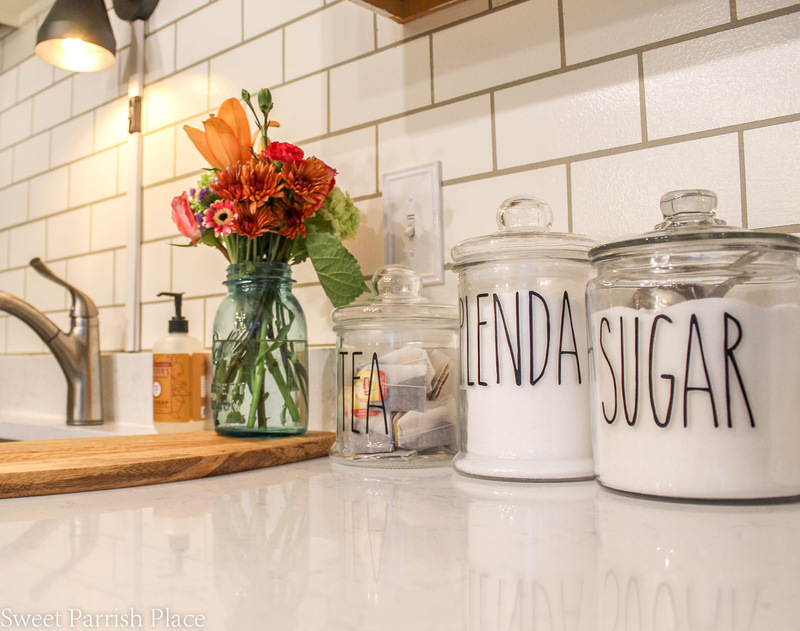 Your kitchen is super adorable! Thank you much! The tile took me quite a long time to finish, there are just a lot of steps to do. I have a ful tutorial on the blog for it if you are interested! I love mine and it has held up perfectly! What a sweet and wonderful comment, you just made my day! This is amazing! 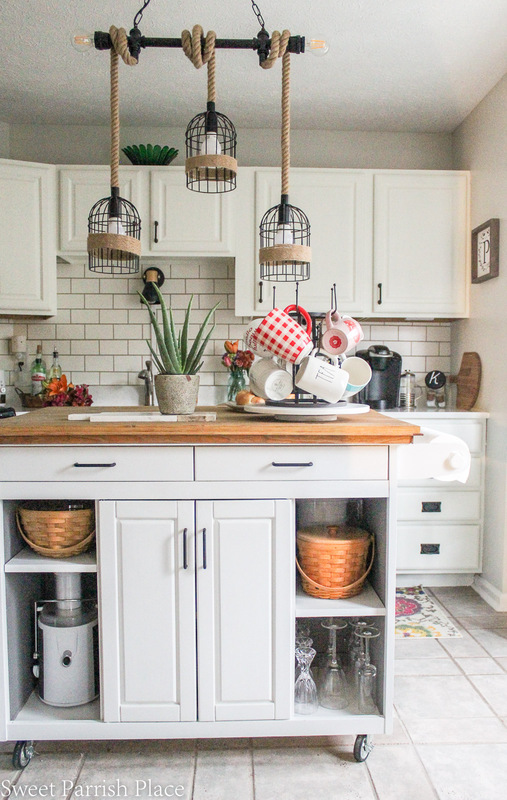 I have a client with the same color cabinets that you started out with, and she desperately wants a rustic white kitchen. I will absolutely be sure to share this post with her. You did an amazing job with this transformation. Congrats on a successful finish! Thak you so much for that Ola, it’s so kind of you to share! Nicki! 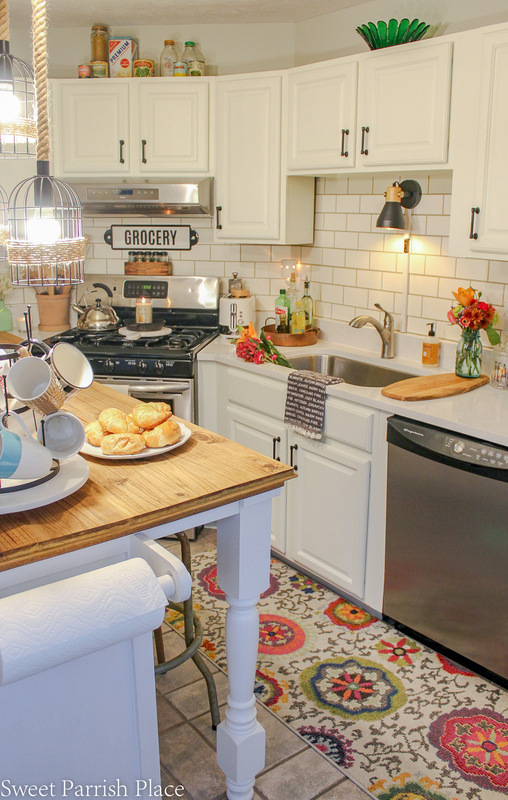 This is such a gorgeous kitchen! I love all the vintage touches here and there. 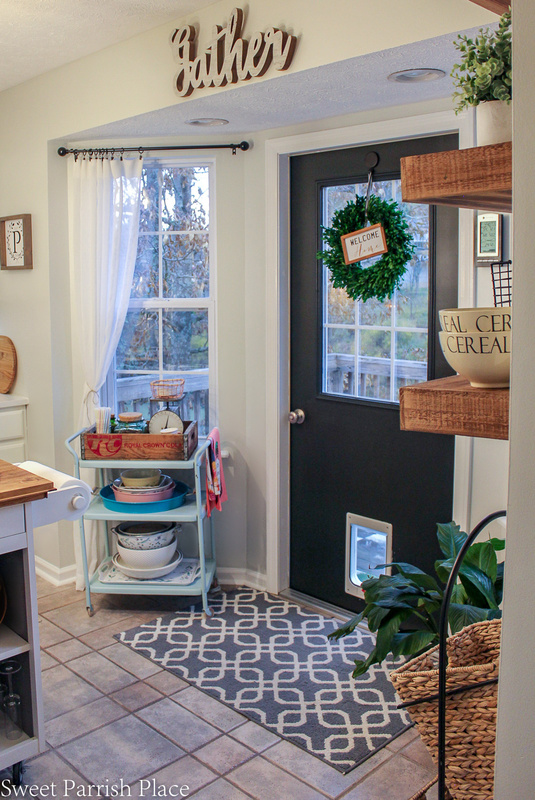 It’s perfectly farmhouse-y and bright! Congrats on an excellent reveal! Thanks so much! I am sitting here in my new kitchen as I type this! Awesome job! It’s so light and bright!!! I’m in love with your island! Thank you so much! That island has been evolving for years, and finally think I have it the way I want it! Thank you so much Lindi! I loved your bathroom so much! Ahhhh Jill! I miss you and thank you so very much! We need a girls day! Love this transformation! 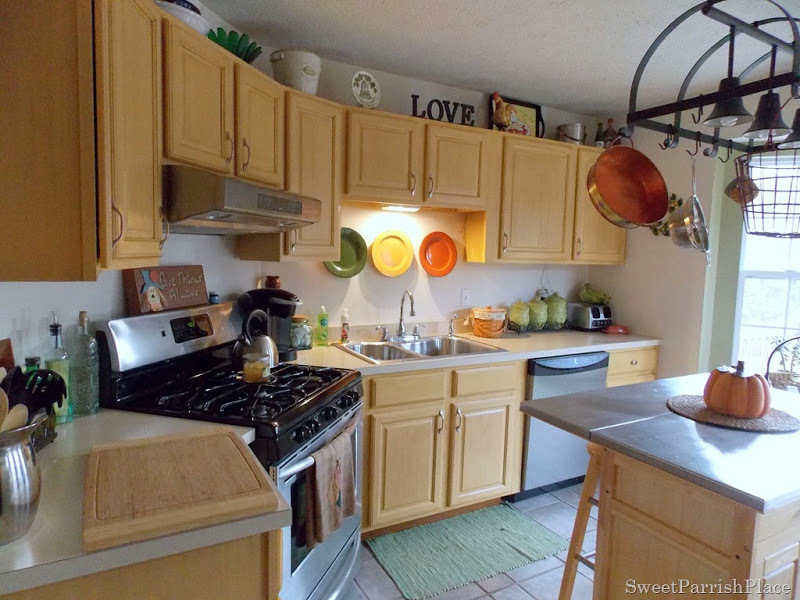 What a difference changing the hardware as well as repainting the cabinets! I loooove the hardware from Liberty Hardware. And the power of paint always amazes! Thanks so much! 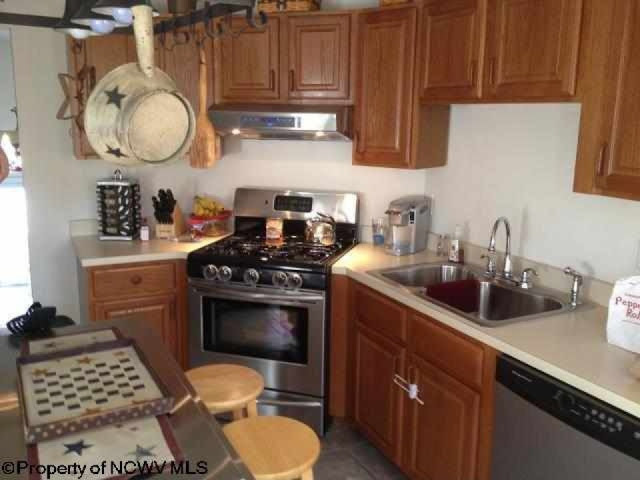 I love your “new” kitchen, Nicki! Fantastic job! Carol recently posted…What Happened To Thanksgiving? Thank you so much Carol! I’m so happy about it! And we are hosting Thanksgiving dinner at my house on Saturday so it will get broken in! Dream kitchen so far.. I love it!!! Modern-rustic feels. Awesome work!!!! Thanks so much Kyra! So sweet of you! Nice looking kitchen. I would suggest buying old catering equipment. Really cheap and good product. Fantastic job. I am so proud of you. I love the new light too. Frederick A. Gonzalez recently posted…How to claim a Warranty for a Mophie Product? When browsing all the types of kitchen equipment and appliances, it can be hard to find what you need in the mix. The initial cost of the equipment and the amount it will cost to run the unit are the most important costs to evaluate.